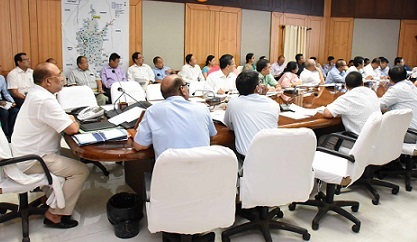 Manipur Chief Minister N Biren Singh has reviewed the ‘Go to Village’ (GTV) mission during a high level meeting held at the Cabinet Hall of Chief Minister’s Secretariat hereon Thursday. The overall in-charge of the mission and Additional Chief Secretary (Works, Forest and Environment) Suhel Akhtar gave a power-point presentation on the progress of the mission at the meeting. Chief Minster N Biren Singh heard the problems and suggestions from the nodal officers, Deputy Commissioners (DCs) and other officials regarding proper implementation of the GTV mission and delivering services and benefits to the masses. The CM also directed the officials to minimise the number of pending cases. Stating that fish production is a priority area of the State Government, the Chief Minister directed the Fishery Department officials to explore means to address people’s requests from the State Government’s schemes without waiting for Central Government funds. The Chief Minister also said that more additional funds would be released to the DCs for organising GTV camps. Chief Secretary Dr J Suresh Babu, administrative Secretaries, nodal officers of different districts, DCs and heads of departments and other high ranking officials of the State Government attended the meeting.